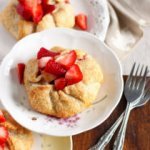 The recipe for these rustic mini Strawberry Galettes makes just 4 servings and are perfect for two. They would be ideal for a date night at home, with a little left over for the next day. As promised from last week, more spring berries! 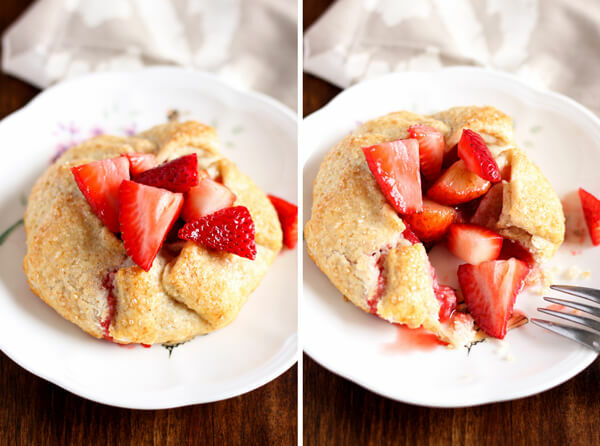 Today, I’m sharing with you a small batch individual size Strawberry Galettes recipe. This recipe makes just four mini galettes, perfect for two, i.e. dessert one night and breakfast the next morning. Left over dessert for breakfast is always the best kind, especially for Monday morning. It gives you something to look forward to, and get yourself out of bed, right? I love pie, and I love making pies for big family gatherings like Thanksgivings or backyard barbecue. But when it’s just the two of us at home and I have a hankering for pie, I will gladly make a galette instead. To me, galettes are rustic freeform pies. They don’t have to look perfect. But they taste delicious and comforting. I also have a weak spot for cute mini dessert. 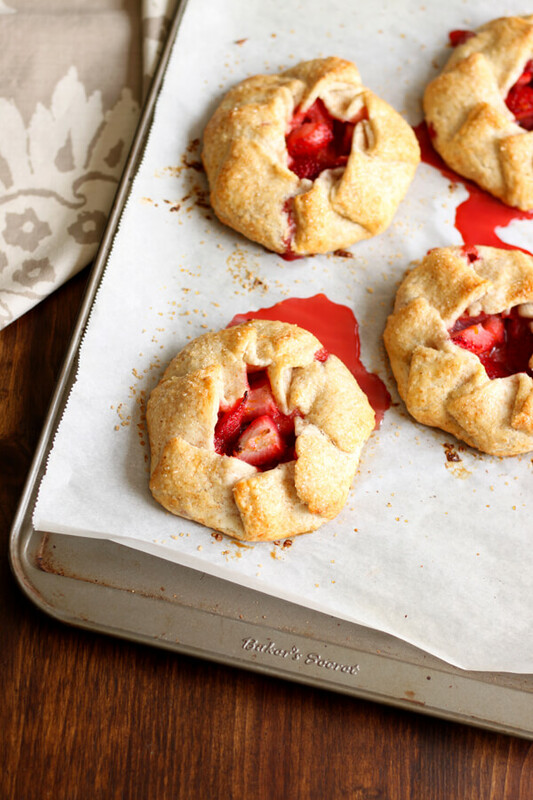 So naturally, these strawberry galettes must be individual serving size. 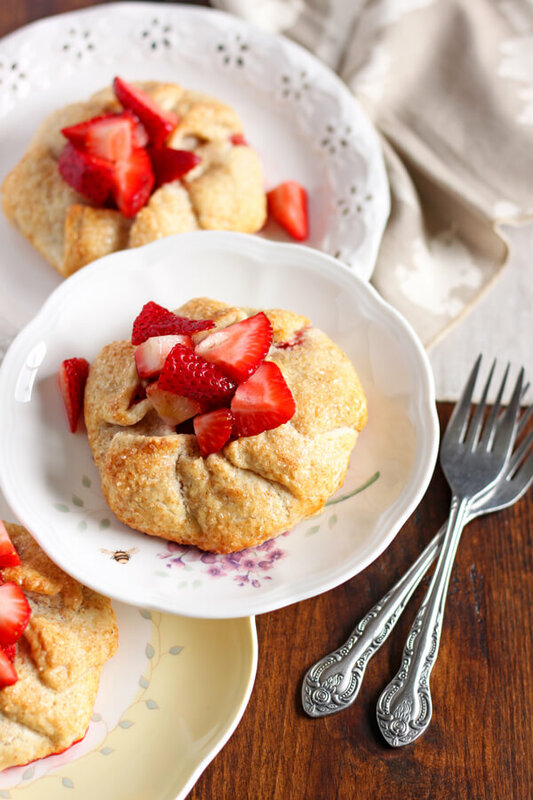 You can serve these galettes with macerated strawberry just the way they are. But I highly recommend adding a little whipped cream and/or ice cream for dessert. The left over is best warmed in the oven and NOT the microwave to keep the crust from getting soggy on the second day. And of course, have your breakfast with coffee as usual, just skip the ice cream or whipped cream so you don’t get an early morning sugar high. 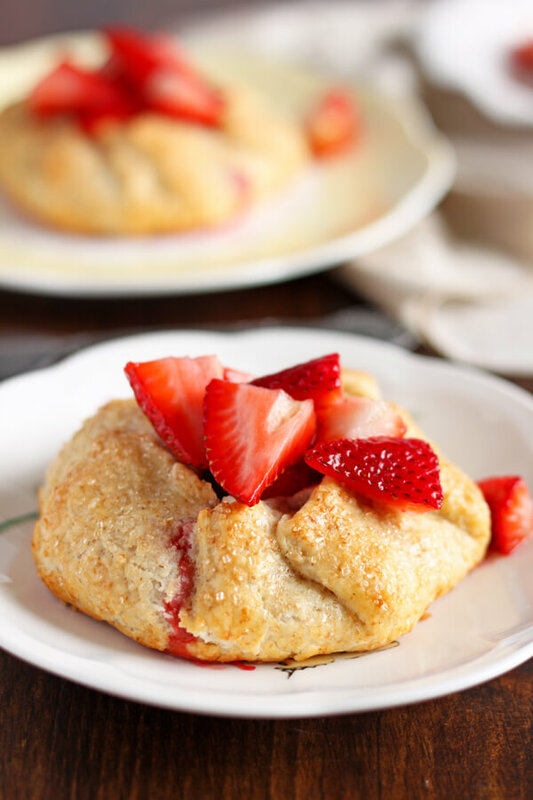 I dare say making strawberry galettes is a good way to start the week, so happy Monday! 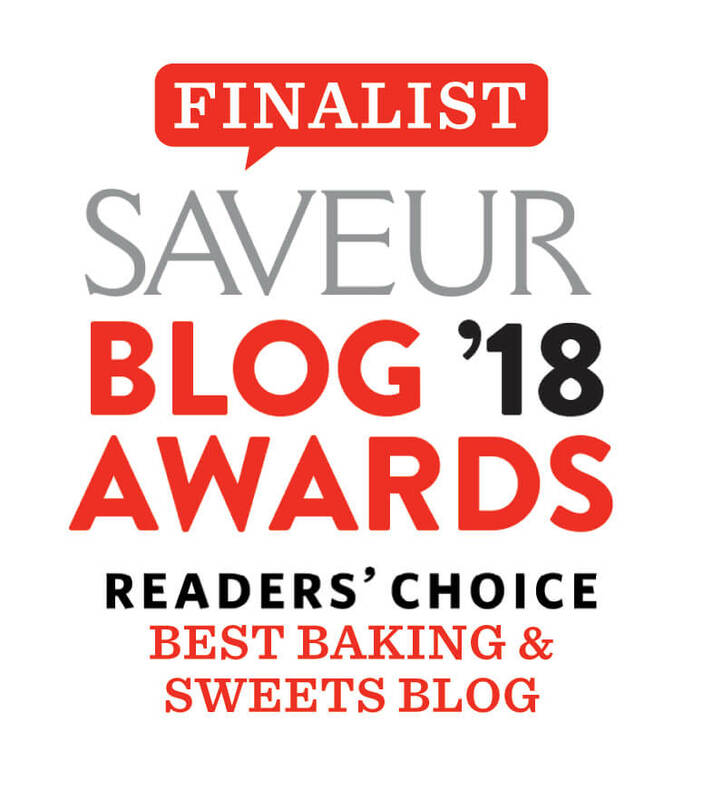 To prepare the crust, put flour, sugar and salt in a small bowl and mix thoroughly with a whisk then transfer to a food processor fitted with the dough blade. Cube the cold butter and add to the flour mixture. Pulse several times until butter is about pea size and mixture resembles coarse crumbs. Divide pie dough into 4 equal portions, about 3 oz. each. Shape each portion into a disk and roll into a circle about 1/8” thick. The circle will be about 6.5” in diameter. Place pie dough circle on a parchment line baking sheet and chill in the refrigerator while you prepare the filling. To prepare the filling, quarter the small strawberries, and chop the larger ones into 8 pieces. Add 2 cups to a small bowl. Combine 2 tablespoon of sugar, 1 tablespoon of flour and 1/2 teaspoon of orange zest and sprinkle over strawberries. Mix with a spatula to evenly distribute. Use right away. Spoon 1/2 cup of filling onto each pie dough circle and fold the edges over the filling. For the topping, add 1 cup of chopped strawberry to another small bowl with 1 tablespoon of sugar and toss to combine. Refrigerate until ready to use. Beat an egg with a tablespoon of cream to make egg wash. When ready to bake, take the baking sheet out of the freezer, brush egg wash all over the crust. Sprinkle liberally with turbinado sugar. Bake for 25 – 30 minutes until the crust is golden brown. Remove from oven and place the baking sheet on a wire rack to cool. 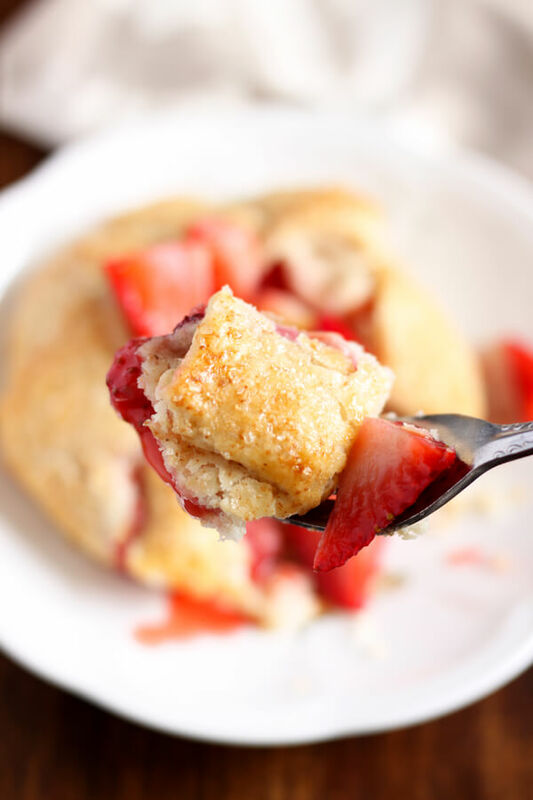 When ready to serve, spoon 1/4 cup of the macerated strawberry over the top of each galette, serve with whipped cream and/or ice cream. 1. If you want to make homemade whipped cream, add 1 cup of heavy whipping cream, 1/4 cup of sugar and 1/2 teaspoon of vanilla extract to a mixing bowl, beat until stiff peak. Refrigerate. 2. These galettes are best they day they are made, when slightly warm. But they will keep in the fridge in an airtight container for up to 5 days.